If you're not a doctor, medical student, health care professional or even doctor-turned-blogger, then you can probably skip this post. 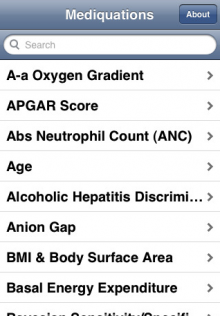 Mediquations Medical Calculator [$4.99, App Store] provides a set of frequently used medical equations from your iPhone. Over 40 common equations are supported, including the MDRD, Free Water Deficit, and Fractional Excretion of Sodium.